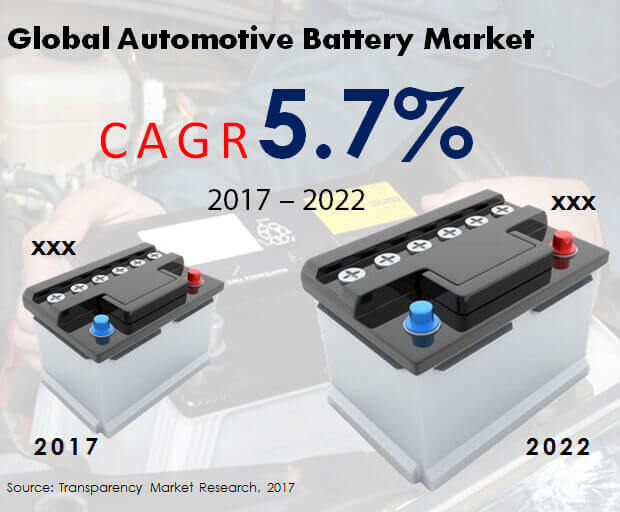 The changing landscape of the global automotive battery market was estimated to increase the importance of the product in years to come by the Transparency Market Research (TMR). To develop components of automobiles for enabling electricity optimization, new mechanics and designs are adopted by Original Equipment Manufacturer (OEM) and automotive battery manufacturers like Exide Industries Limited, Hitachi Ltd, Johnson Controld International plc, and Furukawa Electric Co.Ltd. . These factors support the incorporation of advanced batteries in automobiles. The market has witnessed the introduction of automotive battery technology that enables quick recharge and offers power-saving options. In this regard, automobile manufacturers and OEMs are expected to focus on the optimization of smooth power consumption during the development of vehicle system components. TMR forecasts the global automotive battery market to be valued at US$54.5 bn by 2022 with an estimated 5.7% CAGR during the forecast period of 2017 to 2022.With a 38.0% revenue share achieved in 2017, small sealed lead acid (SSLA) segment is predicted to lead the market on the basis of chemical composition. With a valuation of US$15.1 bn by 2022, Europe is expected to maintain its position as the larger region. The strong growth of SSLLA automotive battery is predicted by market analysts. As more number of electric and plug-in hybrid vehicles are being produced presently, lithium-ion (Li-on) automotive battery is showing a steady sales growth. Owing to the promise of successful commercialization and attractive incentives, OEMs are encouraged to introduce new hybrid and electric models. OEMs are compelled to develop products that fulfill future transportation and similar other requirements because of strict emission norms and global demand for fuel efficiency. The advent of electric vehicles has caused a growth in both the number of electric vehicle models as well as OEMs. For example, in 2017, Mercedes Benz had decided to introduce plug-in electric vehicle model. Along similar lines, Toyota is expected to launch a plug-in hybrid and all-electric vehicles by the end of 2018. The availability of underdeveloped support infrastructure for electric vehicles is negatively affected by the forecasted demand for automotive battery. Moreover, it is difficult to provide products at a parallel competitive pace for automotive battery manufacturers due to the overflowing sale of compact and mid-sized vehicles compared to other type of vehicles. However, less complaints were lodged by manufacturers for the production of automotive battery for compact and mid-sized vehicles because of the less complexity requirement in additional cost manufacturing. Regions that exhibit increased trade activities and high demand for commercial aircrafts and automobiles are yet to be explored by manufacturers. These factors have been anticipated to contribute to the growth of the automotive battery market internationally. An important element expected to reinforce the demand for automotive battery is its economic, technological and infrastructural development.